I had a great time yesterday at lunch listening and watching the Food Research and Action Center’s (FRAC) webinar on Disability, Food Insecurity, and SNAP: Addressing the needs of Americans with Disabilities (click here to watch the recording). The webinar coincided with the release of FRAC’s report, SNAP Matters for People with Disabilities (click here to download). The report states that 1 in 3 American’s with disabilities live in a state of food insecurity. Food insecurity is the inability to provide adequate food for one or more household members due to a lack of resources at some point in the year, according to Alisha Coleman-Jensen (click link to bio), from the Economic Research Service of USDA. She also mentioned in in her section of the webinar the USDA report, Food Insecurity Among Households with Working-Age Adults with Disabilities. I am hoping to take a close look at both of these reports and get back to you all with information regarding North Dakota specific information. This is an issue that I don’t know personally and I hope to learn more in the coming months. If anyone has some information they would like to share with me please contact me at NDESPA@agree.org. 1 in 3 Californians are now enrolled in Medi-Cal, California's Medicaid program according to the state Department of Finance. By simplifying their enrollment process and voluntarily expanding its programs California's Medi-Cal program pushed past the 12 million enrollee mark according to an article on San Luis Obispo's The Tribune website. Thanks to AARP for bringing this to our attention. The interesting thing in the article is that the majority of the individuals enrolling in the program already qualified under the traditional Medi-Cal program, not the expansion. This would indicate the simplification of the enrollment process had more to do with the increase than expanding coverage to adults without children and raising the allowable income levels. How many North Dakotans would be enrolled in Medicaid right now if we made it easier for them to sign up, rather than figuring out more ways not to provide services? The Missouri Valley Coalition for Homeless People is putting on some great programs over the next couple of months. 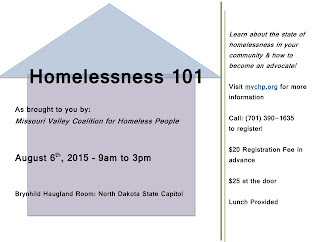 The first is an advocacy training for homeless people called "Homelessness 101" and is scheduled for August 6th from 9 am to 3pm at the Brynhild Haugland Room at the North Dakota State Capitol. It costs $20 in advance and $25 at the door. 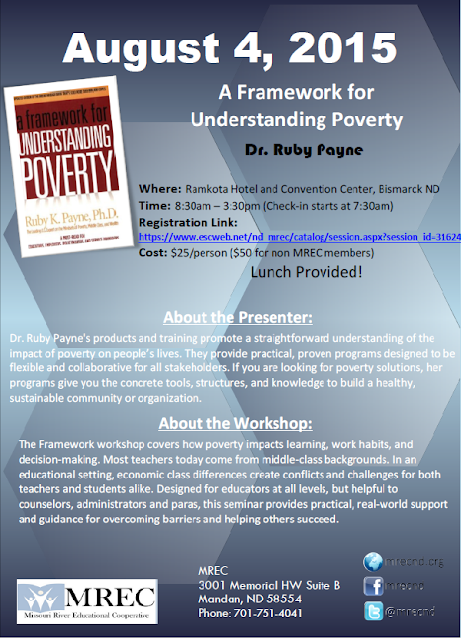 Call 701-390-1635 to register. Lunch is provided. 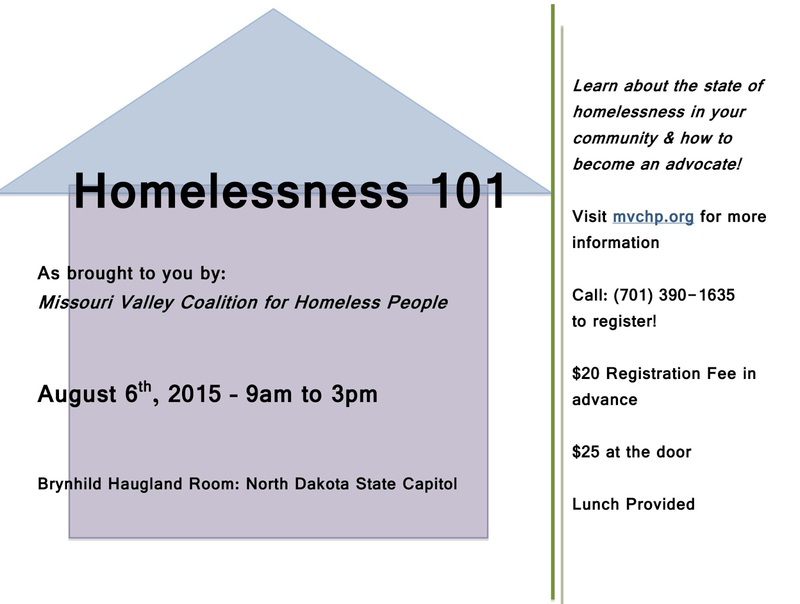 "Learn about the state of homelessness in your community and hot to become an advocate!" 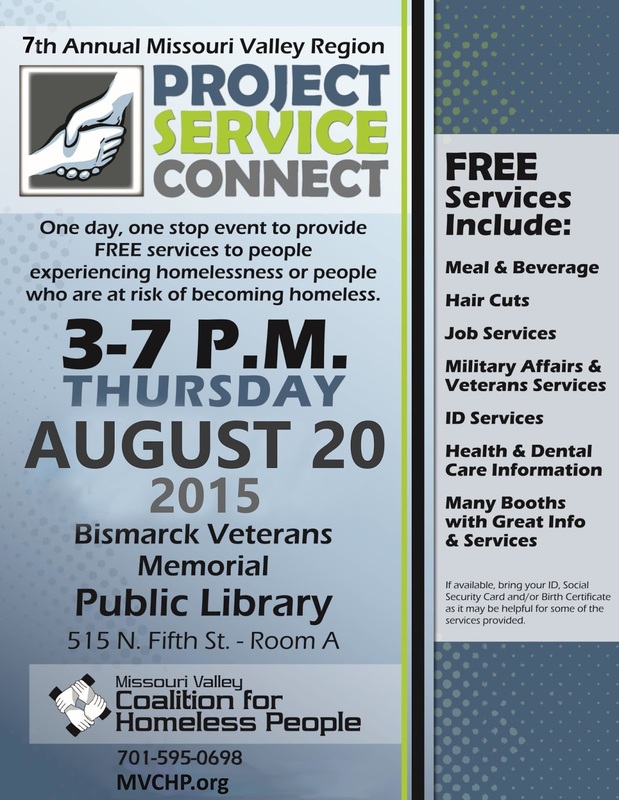 The second, the 7th Annual Missouri Valley Region project Service Connect, is on August 20th from 3pm to 7pm, at the Bismarck Veterans Memorial Public Library in Room A. This is a one day, one stop event to provide FREE services to people experiencing homelessness or people who are at risk of becoming homeless. The services include free meal and beverage, hair cuts, job services, military and veterans affairs services, health and dental care information, and many other boots with great info and services. 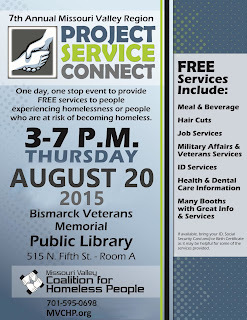 If you have any questions please contact them at (701) 390-1635 or at missourivalleyhomeless@gmail.com.